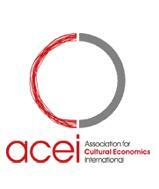 The Association for Cultural Economics International (ACEI) invites you to attend its 17th International Conference of ACEI that will take place in June 21-24, 2012 in Kyoto, Japan. Information about the host university, the conference, the social program and other issues that may be useful can be found on the ACEI 2012 website within the Japan Association for Cultural Economics site. All scholars, business practitioners, consultants and policy-maker with an interest on the economics of culture and the creative industries are encouraged to attend the conference.